Meet Janie. 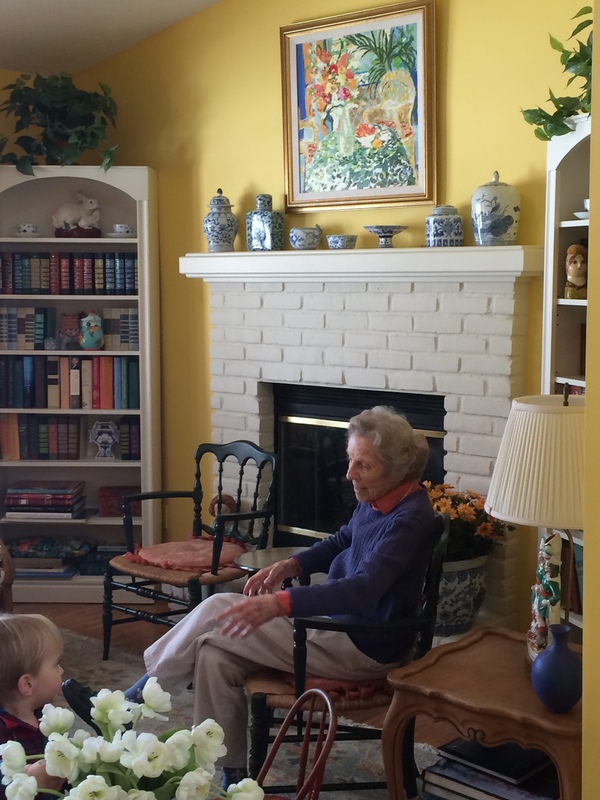 At 101, she redecorated her living space with my fabric. I felt she was a natural start to 2015 for this series. She also happens to be my grandmother, and where much of the creativity in my family stems from. 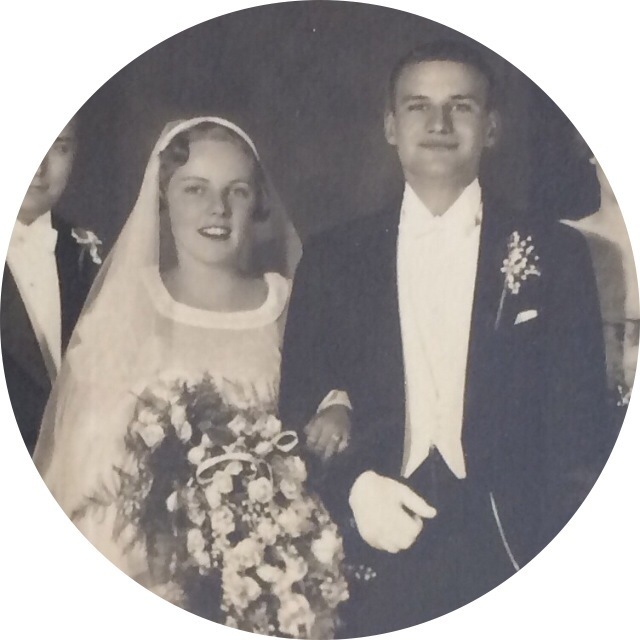 Here she is as a blushing young bride with my Grandfather, Cliff. These two met at The University of Michigan. My grandmother was on a date with someone else, and got a call about a fun party going on at the SAE house, and suddenly got a terrible headache and called a cab to get a lift home away from her date. That night after her miraculous recovery, she met Cliff in the kitchen making fried egg sandwiches, and they were married just under 70 years. 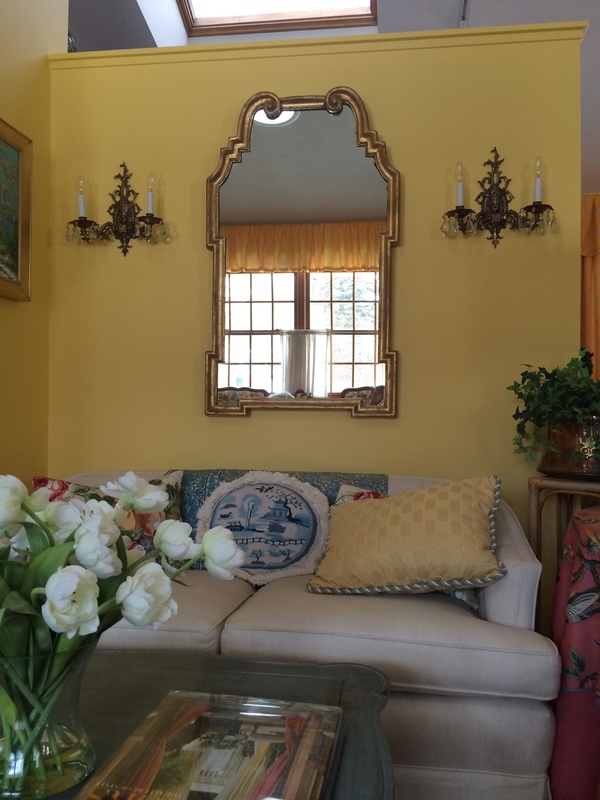 Since Janie got married, she has moved, redone, and redecorated 21 homes. Somehow I was lucky enough to snap pictures of all of her precious renderings, and here is a complete slideshow of all of these homes starting in 1935. 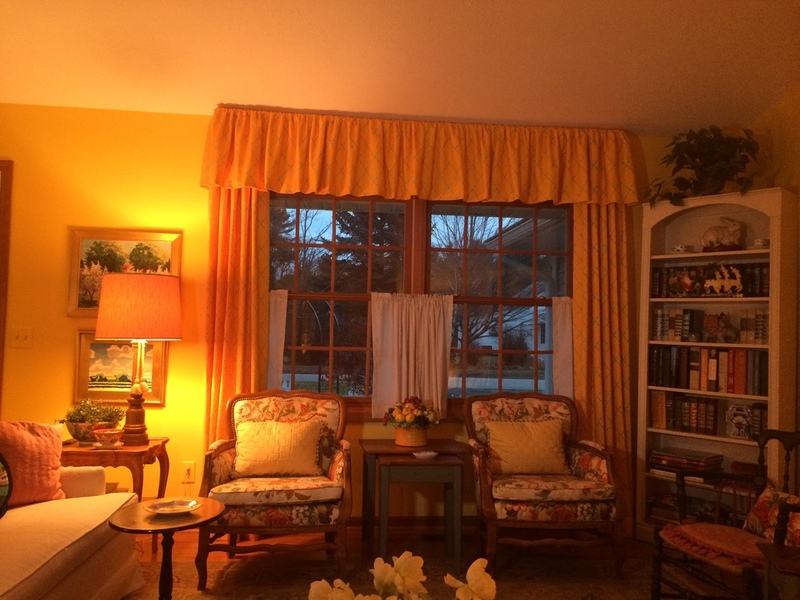 She chose the color "Taxi cab yellow", and had a light tube installed into her living room. 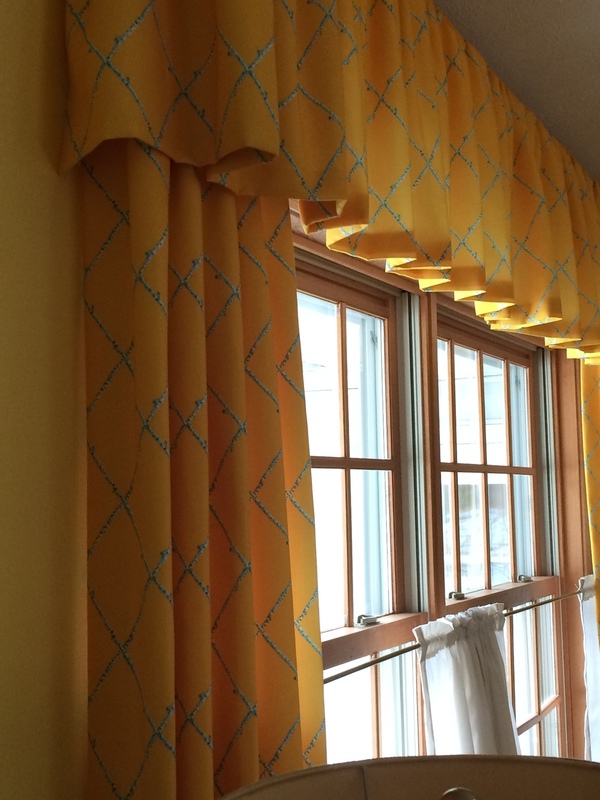 She pondered many Leland gal prints, and finally settled on choosing a custom yellow with the birch lattice to suit the space and continue to make the space sunny. 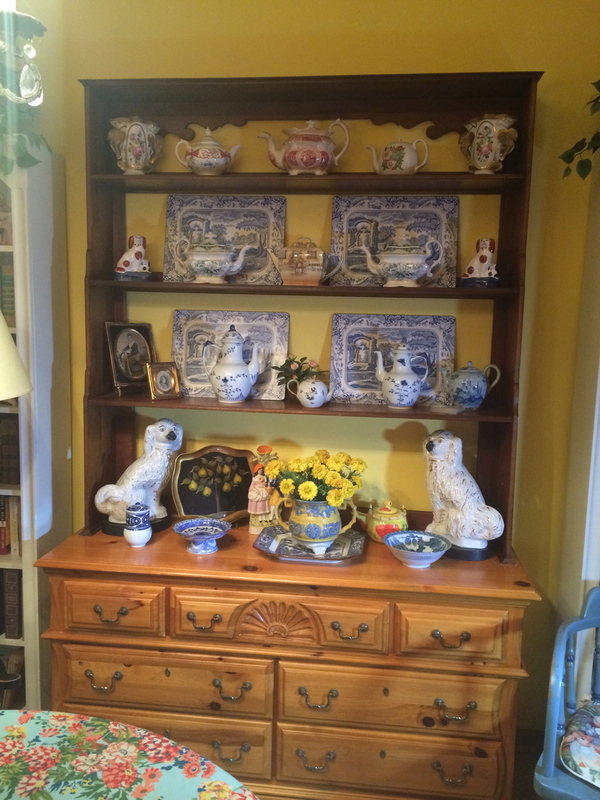 Janie also collects blue and white Willoware, as well as vintage teapots which are a great compliment to the yellow, and pulled out a vintage Nell Revel Smith for over the mantel with her new colors. Since Janie is small in stature, we always get a kick out of how tiny her furniture is. The beauty of such small pieces is that she can move them around herself. Slowly but surely she has rearranged this space hundreds of times. Of course, we've asked if we can help, but the answer is usually, no. Here, Janie is telling Tommy about life during the depression. 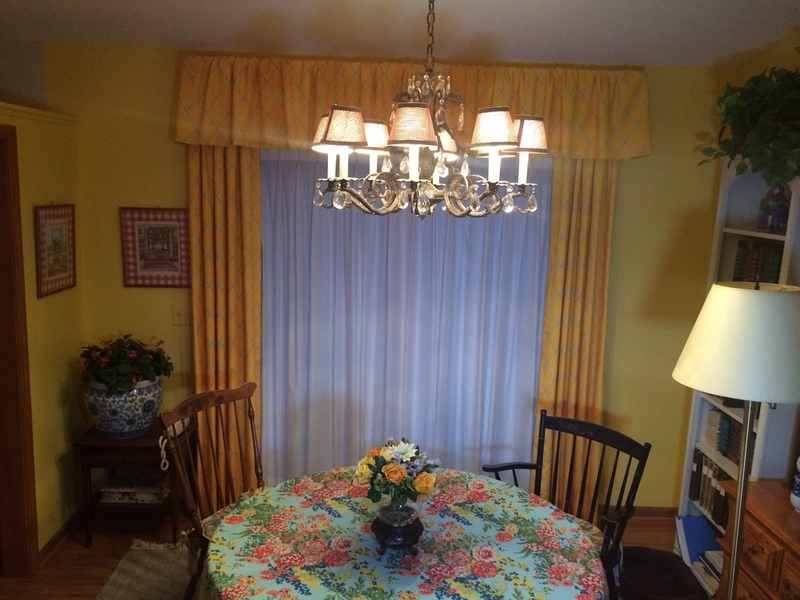 Here is what the space looks like in the afternoon/evening in the living room and dining room. She has turned this small ranch style home into a wonderful place for cocktail hour, sewing club, and of course, bridge. Janie welcomes friends and family here to connect and tell stories. Janie has never been afraid of color. I can remember her telling me as a kid that she painted an entire dining room set coral, and even then thought she was one of the coolest people I knew. That takes guts! Janie was an interior decorator in her former life, and I recently discovered, she wrote for a paper in Ann Arbor to express her creativity. 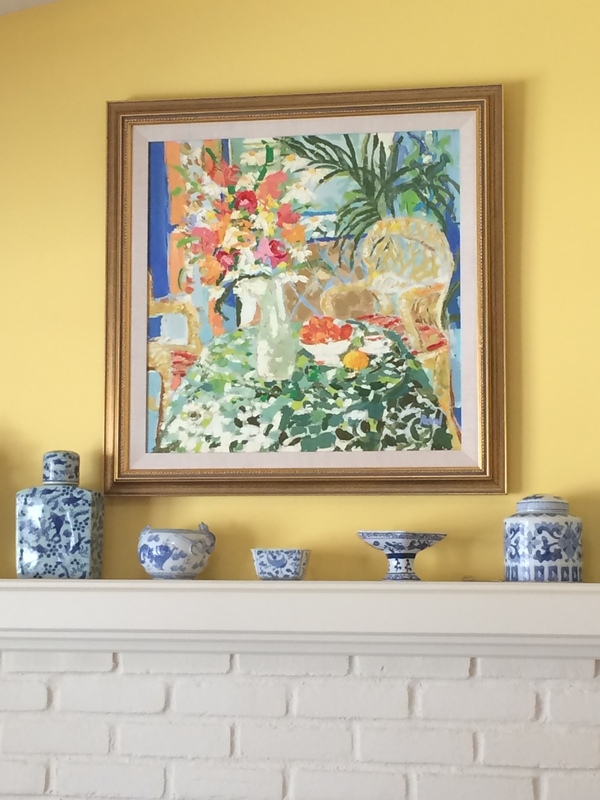 Janie may have a few collections of things, but she remains very practical about living with just enough, and continues to inspire people with her more important collection of stories and memories of a long fulfilled life. Janie's biggest winter project is one you will all be wanting to bid on for a fundraiser for The Old Art Building in Leland. This might be her finest needlepoint to date, and I love the colors already. She's picked up the perfect bench to reupholster with it at Jaffe's in Lake Leelanau. Favorite Movie? "The Philadelphia Story" Written for Katharine Hepburn with Cary Grant, Jimmy Stewart and "Satchmo" with a great cast. The background is beautiful with park like grounds, a magnificent old home inside and out. Scenery contributed to my love of this movie a lot. Favorite Song to Dance To? Anything from Big Band Era. I Loved to dance with anyone that was a good dancer, and could follow along very well. Loved to twirl around, kick here, kick there, and even travel up steps with the right partner. Loved the song "Anytime" by Rogers and Hart and also loved to Tango and Benny Goodman (below). Aspiring to? You might say at my age, I have aspired to a great marriage to Cliff for 70 years, a great family, many friends, design work, and lots of reading. I aspire to continue to dream up what is to come for myself, and my family. Favorite Creative Pastime? Designing needlepoint on canvas, drawing house plans (for fun), playing and teaching bridge, and walking my Pomeranian, Dolly around the neighborhood. How has your upbringing influenced your creativity? Lonely as a littler girl, with no friends my age in my neighborhood, I would rearrange my bedroom DAILY from ages 5-7. I watched my mother creating all sorts of things from cloth. 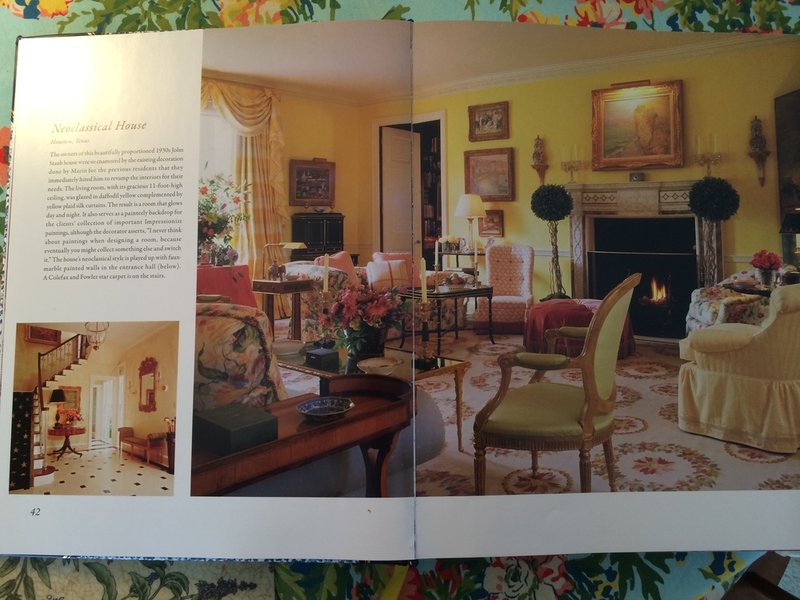 She would cut out with patterns on the dining room table and stitch up dresses, skirts, lined coats, window treatments all in perfect color schemes. In college I enjoyed being the editor of the school paper, which resulted in getting a summer job in Ann Arbor at "The Daily". How does Janie Leland gal? 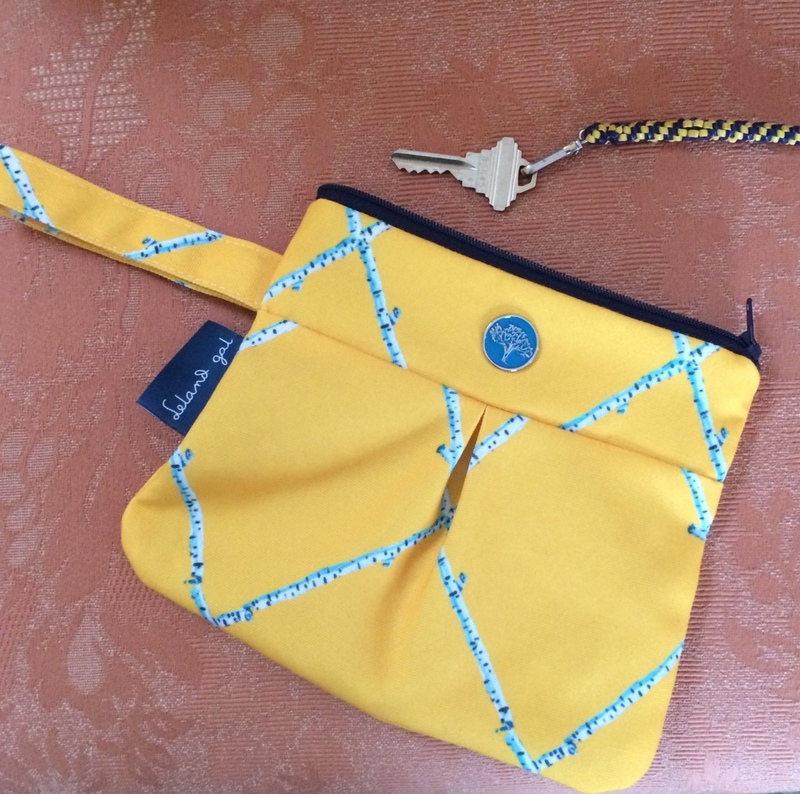 In addition to her new decor, I made a spinnaker wristlet for Janie so she could show people the color of her new room out and about. When you pick Janie up for dinner, she only needs to bring one thing, and that's her house key, complete with the lanyard in U of M colors that my brother made for her when he was at camp. 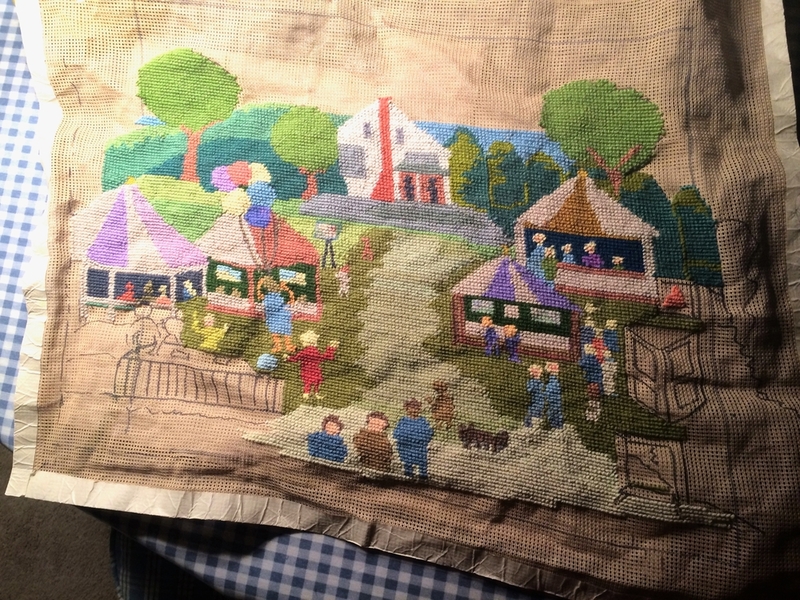 Stay tuned for details of where Janie's needlepoint will be auctioned off, and more stories about her inspiring life. Janie’s life story of creativity is so inspiring! Oh how I wish I could hang out with Janie. Seriously. I love this post! The collection of your grandmother’s drawings are wonderful. So special. Fascinating lady and article. I love the paintings of her homes. I wandered into Leland Gal when my best girlfriends and I were in Michigan on vacation this past 4th of July. I was so inspired by your designs, your story and how you are building your business. I’m an artist, and I so appreciate all the work and planning you’ve done to build a business and a brand. I love your work! Your designs and your sense of color are so…Happy! I just read through your blog and totally enjoyed each post. Love the photos and the stories about your Grandmother. Talk about a woman of style! I am a fan now, so I hope to drop by next time I’m Michigan, and I will be looking forward to following your path! Best wishes!